Verona – the city of love. This is a beautiful city, the old town especially, steeped in history, winding alleyways and streets, churches, gelato and much, much more! We spent a month there, spanning September and October, the weather was perfect, the crowds were slightly thinner than the height of the season, and the tomatoes were perfect. We'd like to share a few of our favourite experiences in Verona and help inspire you to do the same, especially if you've never visited before. There are plenty of hotels in and around Verona, although we prefer to use Air BnB, which is a home from home for us, with all the facilities we need. We like to cook most of our own meals, having a well equipped kitchen is important. Also a washing machine is a must, we travel light, so being able to wash our stuff is important! Booking Air BnB for a month or just over offers a sizable discount and is definitely worth it. We stayed nearer Basilica San Zeno than the old city centre of Verona, with an easy 40 minute walk into town through pleasant neighborhoods and along the river. There is a frequent bus service right to the Centre available from anywhere. Booking.Com is another good place to find accommodation, especially for shorter stays or if you don’t need home necessities. Italy has a very good train service and getting out of Verona for day trips is easy. The main station is Porta Nuova. TreniItalia service provides regular trains to places such as Venice, Padua, Vincenza, Lake Garda, Milan, or Bologna. These are the trains that stop at many stations before the final destination. They do occasionally run late and sometimes can be replaced by a bus service. On a day trip to Padua, we bought our tickets, checked the departure board to see which platform it was leaving from. Instead of a platform number, there were the letters 'PE'. 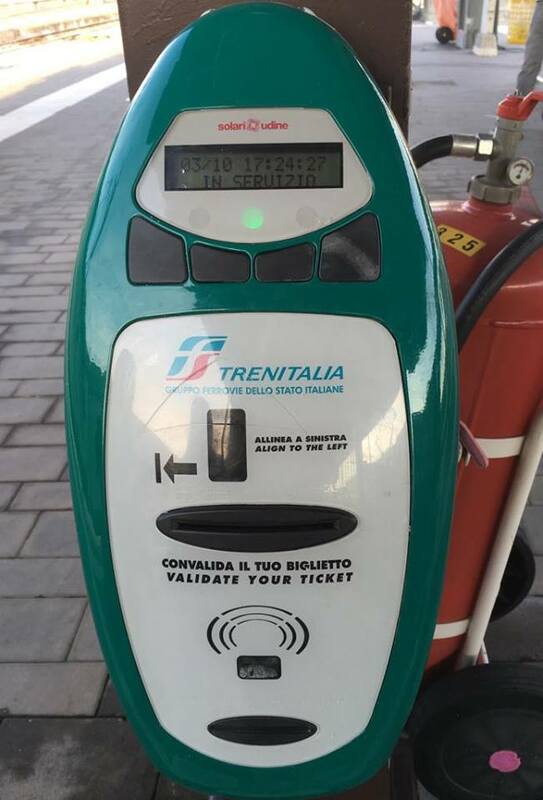 None of the other platform departures were displaying these letters – it felt odd, we managed to find a member of staff who spoke a bit of English and together with our limited Italian, we discovered that there was no train for the service we had purchased tickets for, it was a bus. Nothing was said to us when we bought the tickets! The faster, modern Le FRECCA trains have a faster service, stopping at less stations, although tickets are more expensive. When you buy your ticket you first have to take a numbered ticket from the machine located just outside the ticket sales area, wait for your number to come up on the screen, then go in to buy a ticket. We've found this to be the case in Germany, Holland, and Austria too. Make sure you validate your ticket before boarding a train. The machines are green and can be found on the platforms. You can get fined if you are found with a non validated ticket on a train. If you are traveling with a dog – they have to have a ticket too, which is half the cost of a regular fare. We found the trainline.eu app useful for checking services, and if you purchase tickets online they can be downloaded to the app. We were in Verona for over a month and only really scratched the surface of things to see and do. You won't see everything – pick the things that interest you and be realistic in conjunction with the amount of time you have. A lot of Verona old town area is pedestrian friendly – we enjoyed walking around the endless maze of streets, although it’s hard to get lost completely as it's not really that big. Piazza della Erbe is the main square where you will find a daily market selling all kinds of tourist stuff, fruit and vegetables, clothes and household items. On any day and at any time it's heaving with tourists and their selfie sticks, although locals shop there too. You'll also find plenty of cafes and restaurants in the area and they all seem to charge similar prices. You can sit, relax have a coffee or sip an aperitivo and watch the world go by. Most places have a cover charge when you sit down – in the region of 2 Euros per person. You won't miss Torre dei Lamberti, towering over Piazza della Erbe, it's the tallest of Verona's towers at 84 metres. It dates back to 1172 and has been added to over the centuries. For 8 Euros it's worth taking the elevator to the top, getting a 360 degree view of Verona and the surrounding hills. We couldn't be in Verona and not pay a visit to Juliet's balcony (we know it's a 20th Century addition to an otherwise false Capulet house), it certainly attracts plenty of visitors, all eager to photograph that balcony. Our advice is to go early before all the tour buses arrive. Castelvecchio was an important military installation in the middle ages, built by the Scaliger family. It's seen its fair share of damage of the centuries, but it remains one of the most recognisable buildings in Verona. There is a museum for visiting, or you can walk across the River Adige on the Ponte di Castelvecchio for another photo opportunity. In Piazza Bra you will find the Arena, a Roman Amphitheatre. Older, and even more complete than the Colosseum in Rome, it's still very much in use today. For 11 Euros you can get a tour. This is also the place to see a favourite Italian opera or concert. Check the website. There are plenty of churches to visit in Verona, most charge entry, and expect people to be modestly dressed, so having something to cover shoulders and arms is advised if visiting in warmer months. If you want to get away from the main tourist area, a walk to Verona's Cathedral, Basilica San Zeno is well worth it. Entry is only 3 Euros with an audio guide in whatever language you need, provided. The interior is stark, with less gold leaf and decoration than most Italian churches, but it has some beautiful frescoes, a fascinating front door and serene cloisters. A stroll along the River Adige is relaxing. You could cross at Ponti di Castelvecchio and walk to Ponti Pietro another ancient bridge which was bombed during WWll. The river was dredged for the bricks and it was rebuilt, piece by piece. Across the road from Ponti Pietro you will find some steps that take you up to Castel San Pietro. The actual building wasn't open to the public when we visited, although you get fantastic views of Verona from there. There is also a bar called Terrazza Al Ponte, where you can have a aperitivo or two before going back down. We enjoyed lovely views whilst sipping our drinks For a few euros you can get on a funicular to get you there and back down if you don’t want to venture up the steep but short stairway. These are just a few of the things we did and enjoyed in Verona – you could check out the tourist info website for more options. The quality of food available at any grocer is so high that cooking at home makes one feel as though they are a top chef! We did however, find a couple of easy lunch places. Sapore is a pizza, sandwich bar. It's not a restaurant although there are a few bar stools inside. It sells a selection of pizzas slices and sandwiches, sold by weight. A typical portion costs 5 euro. It's all delicious. You can find it in Via della Costa, just opposite the entrance to the Torre dei Lamberti. We would get our lunch and take it in to the Piazza dei Signori (or Piazza Dante as it's known because of the statue of Dante there), sit on the steps and enjoy our pizza slices. Near to Basilica San Zeno is Piazza Corrubbio. This has a selection of bars and places to eat and drink. The best value Aperol Spritz can be found at 100 Montaditos for 3 Euros. You can't go to Italy without trying gelato – it's everywhere. Our favourite place Cadamore in Piazza Corrubbio makes it on the premises freshly everyday. The selection of flavours is amazing. We recommend trying the hazelnut, after eight mint, or pistachio flavours – you can sample a tiny amount of what you fancy before buying. Cadamore also makes pastries and cannoli on a daily basis. The owner and staff are extremely friendly and it's also dog friendly as many places there seem to be. Tell Anna hello from us! We do miss this place! All times provided above are slow, cheaper train times. You can get faster trains, such as Venice in about 35 minutes but they are a bit more costly so you choose your own delicate balance between time and money. We'll be writing more about these later, so stay tuned! 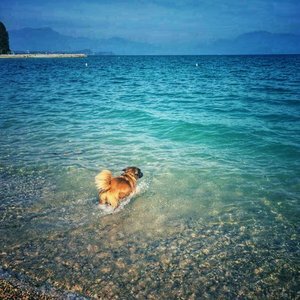 Chelsea having a brave splash in Lake Garda! A couple of other handy things to know – public restrooms are few and far between. You'll find them at Piazza Bra, Piazza Arsenale, across the Ponti Di Castelvecchio, Piazza San Zeno and Piazza della Erbe. Make sure you have some change as a charge of between 50 cents and 1 euro is mandatory. You will see that Italians tend to stand up when having coffee, because a charge is made if you sit down. In fact, there is often a silverware/napkin charge so ask ahead to avoid unwanted or unexpected surcharges. Most shops open early morning, close around 12.30 for lunch and don't open again until 16.30/17.00 staying open into the evening. This is routine except of course, for restaurants, which can sometimes close at 15:00 and re-open at 18:00. Our advice is shop early and eat late to catch all facilities at the open times. We hope this quick introduction of Verona helps and inspires you to put it on your list of places to visit. Though we stayed a month, these agenda items can be easily accomplished within a week if you press your agenda; it’s just not our preference to travel in that way. We do intend to return in the future.